The unthinkable has happened. Yes, my Dolls, Hell has frozen over in my house - my husband finally caved and got me a cat. This is something I have begged for for s decade and I've always ended up on the losing end of this battle. He hates cats. Can't stand them, but I finally wore him down. Her name is Cami and she's an adorable, entergetic tuxedo kitty who likes to romp and play. She has the loudest purr I have ever heard and she has a tiny squeaky snore. I adore her! 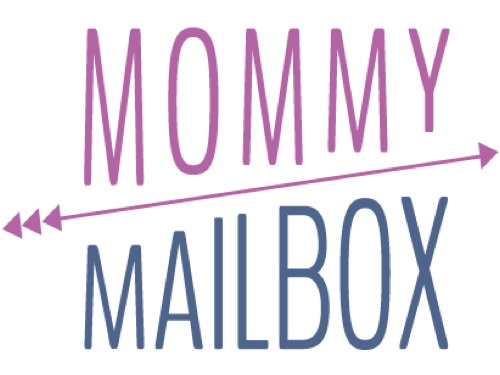 Now let's go to something else I adore and look at the January Mommy Mailbox! Oh! 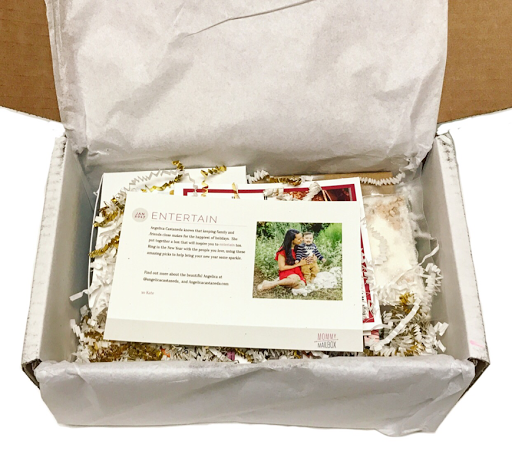 I see boxes inside the box! That always excites me. It's the mystery of it all. 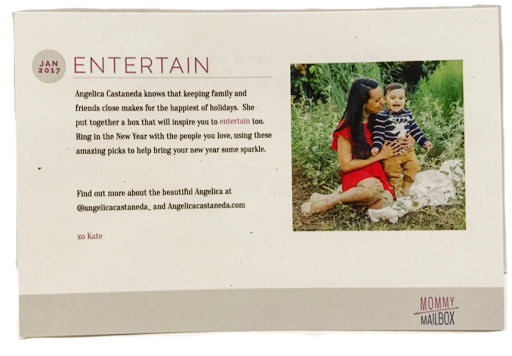 This month's box theme is Entertain and it was curated by mommy blogger, Angelica Castaneda. 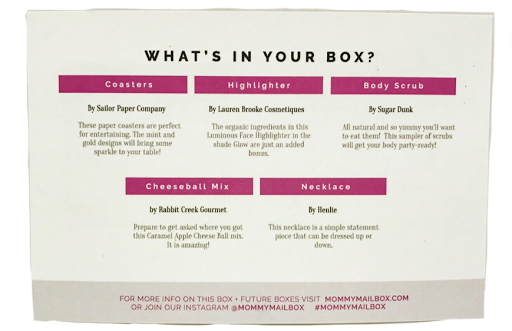 Included is a very detailed information card that lays out each item you will find in your January box. 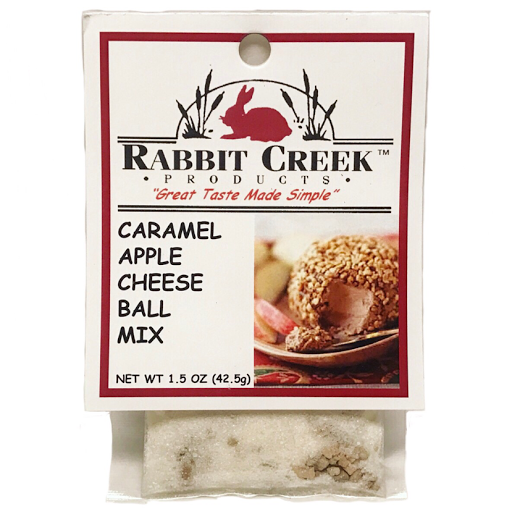 Rabbit Creek Gourmet Cheeseball Mix --- oh! I love a good cheese ball! I honestly don't think I've ever made one that is sweet like this though. Caramel apple? I hope it's as delicious as it sounds! 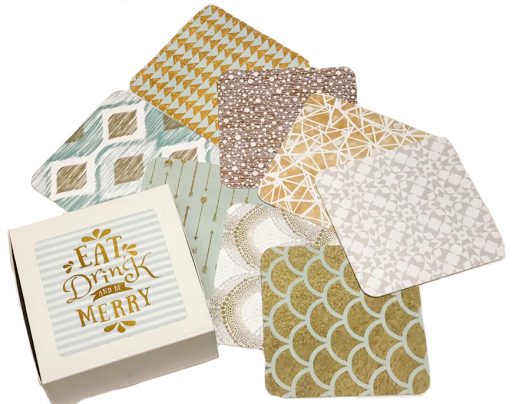 Sailor Paper Company Coaster Set --- the patterns on these coasters are just gorgeous. I'm not usually a giant fan of paper coasters but these are quite sturdy and well made. 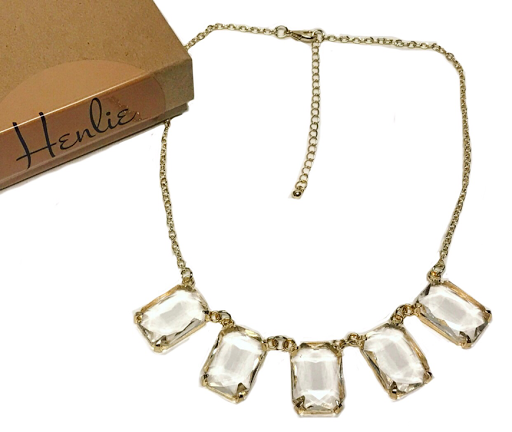 These just have a chic vibe to them and I love it! 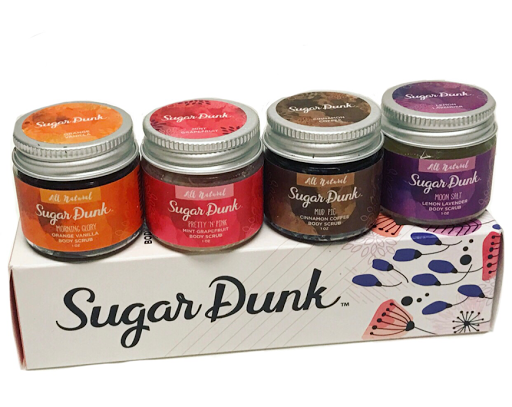 Sugar Dunk Body Scrubs --- Isn't this bright, vibrant packaging just amazing to look at? It is to me, anyway. I love that there are four unique scrubs in here. I enjoyed all of them but I think the coffee one has to be my favorite. It just smells phenomenal. 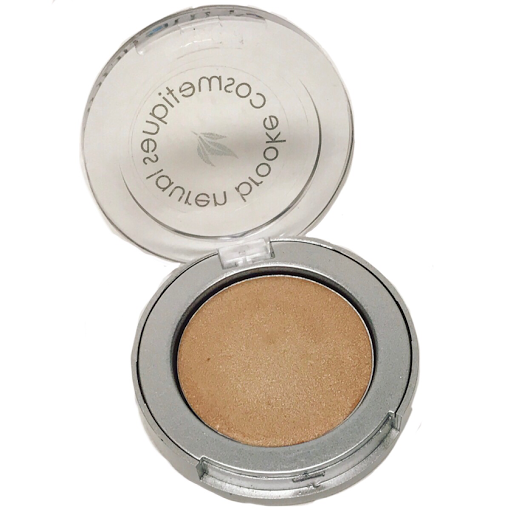 Lauren Brooke Cosmetiques Highlighter --- I cannot begin to explain how much I love a good highlight. 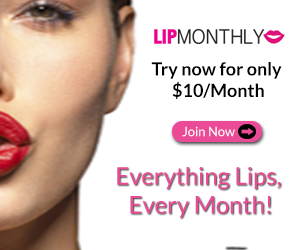 I'm a firm believer in highlight and contour makeup so I go through a lot. This one is superb though! 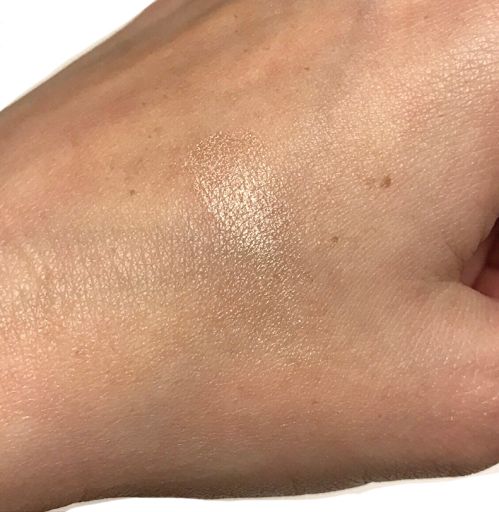 It's a gorgeous, subtle highlight that is super creamy so it blends beautifully and it works perfectly with my fair complexion. Yay! 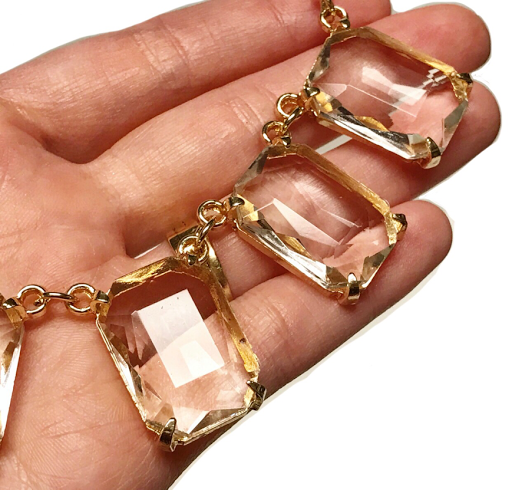 I love that the stones are clear so they look amazing paired with any color you may wear. 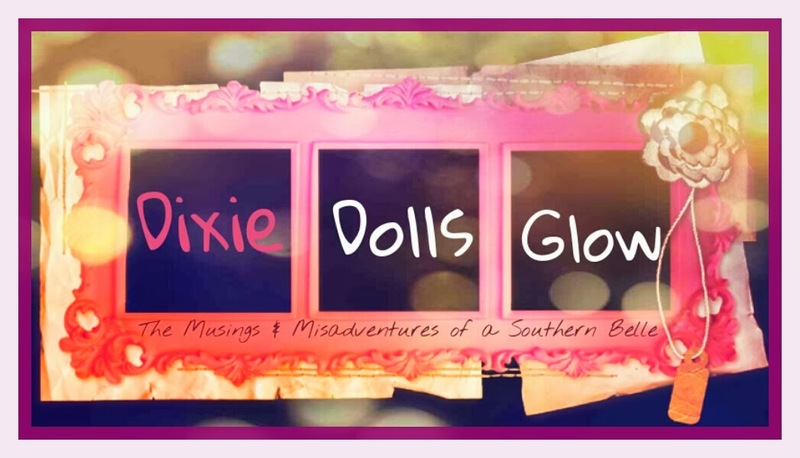 It's very vintage chic to me and I am loving it! 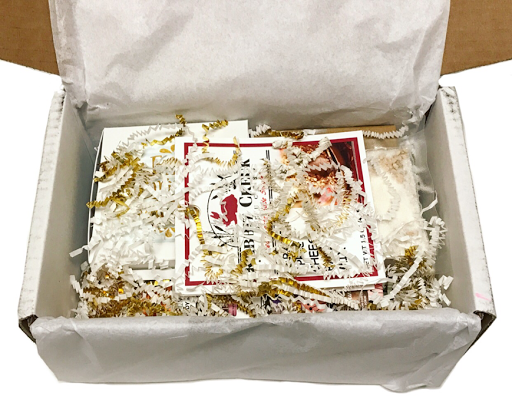 There is no other way for me to describe this box but absolute perfection. 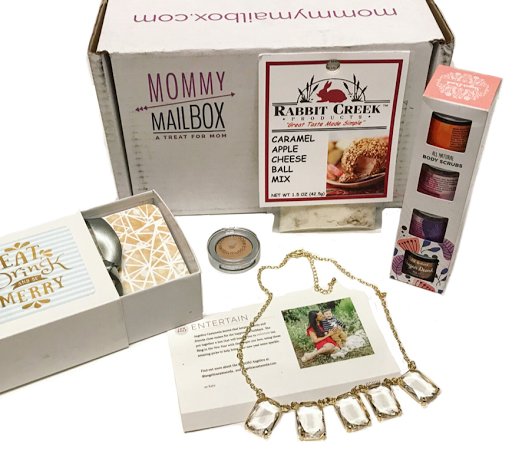 I'm serious, this box continually blows my mind. It's such a fantastic mix of items that honestly just make me feel pampered and happy. It's the things I didn't know I needed until I had them in my hand and I just love it!